The Asian currency crisis of 1997 was foretold by two important astrological configurations in the first quarter of 1997: a stellium of Jupiter, Uranus, Ceres, and Mercury at 5* Aquarius on February 13; and a total solar eclipse at 18*31’ Pisces on March 9. These two configurations were the planetary setup that simply needed to be triggered to create a domino effect. it was conjunct Russia’s natal Saturn 5* Aquarius. This stellium was important because it involved Ceres, which appears to influence currency exchange rates. This is in keeping with Ceres as indicating “boundaries” and the flow of people or assets back and forth over borders or boundaries, or the demarcation line over which elements can pass. The March 9 total solar eclipse chart has another important aspect besides the eclipse: Mars conjunct the North Node 29* Virgo, with both trine Neptune 29* Capricorn. Many of the individual events of the 1997 currency crisis can be seen when these nations’ charts are compared to this eclipse chart. The wave of currency devaluations began in Thailand. 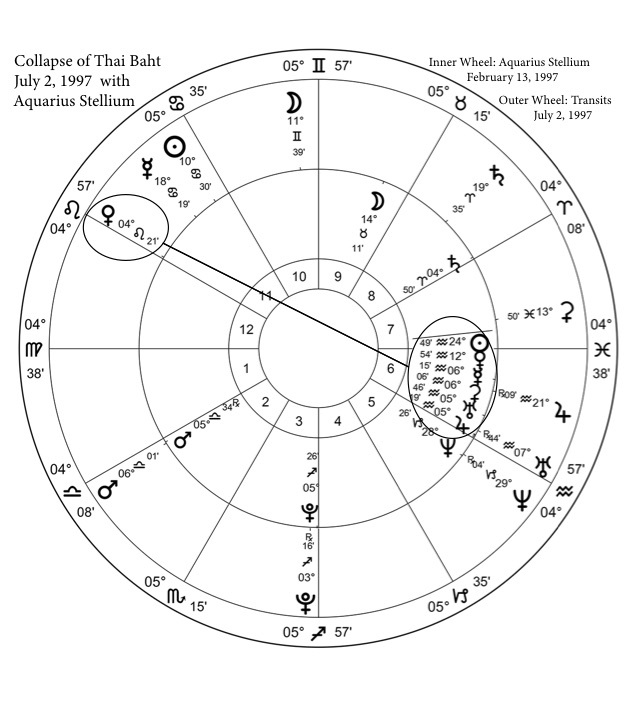 In the months building up to the crisis, transiting Neptune was conjunct Thailand’s progressed Saturn in the eighth house of debt and shared resources. Thailand’s progressed Moon was moving to conjoin progressed Mars at 15* Cancer, right on the cusp of the second house, which rules the currency of the country. The two were conjunct on July 2, 1997, and transiting Mercury had just passed over them, triggering their effect. In this case, the progressed Moon is doubly important: it functions in its usual role as a timer of events, but the Moon, as the ruler of Cancer, rules Thailand’s second house. Indonesia’s currency, the rupiah, was pegged to the dollar and its trading band was widened in July 1997 in response to Thailand’s devaluation. When speculators began trouncing the rupiah, it was allowed to float freely on August 14, 1997. Transiting Neptune 28* Capricorn was moving through the eighth house of Indonesia’s chart, conjoining progressed Mercury 27* Capricorn. During July and August 1997, transiting Saturn passed over 19*-20* Aries and went retrograde, while opposing progressed Neptune 17* Libra. Transiting Jupiter was retrograde, moving from 20* Aquarius to 15* Aquarius, passing over progressed Jupiter 16* Aquarius and natal Venus 15* Aquarius, while opposing natal Pluto 17* Leo. With natal Venus and Pluto involved (the natural rulers of the second and eighth houses of financial and currency matters), this indicated the severe stress on the currency. The opposition of the March 9 eclipse position of 18* Pisces to progressed Saturn 17* Virgo was aggravated at this time by transiting Hades 17* Gemini in Indonesia’s first house. The crisis accelerated for Indonesia in November 1997. South Korea’s stock market plunged on November 7-8 in response to the crisis. November was a sensitive time period in 1997 because the progressed Moon in the chart of the March 9, 1997 solar eclipse had moved to 29* Pisces, the position of the South Node at the time of the eclipse. That this time period would affect South Korea’s stock market, and especially on November 7, was indicated by transiting Mars 28* Sagittarius opposing natal Uranus (ruler of stock markets) 29* Gemini in South Korea’s chart. This opposition formed a T-square with the progressed Moon 29* Pisces of the March 9 eclipse chart (as described above). The 29* Pisces position falls in South Korea’s fifth house of speculation and the stock market. Furthermore, natal Uranus in Gemini is ruled by Mercury; transiting Mercury was at 29* Scorpio – the 29th degree of a sign. China did not fare so badly in 1997 and 1998, but the problems that were exposed at that time – mainly too much debt – have not been addressed seriously since then. In 1997, China had the resources to shore up their currency – probably some hidden resources, as transiting Neptune 29* Capricorn was in the twelfth house, conjunct progressed Jupiter 27* Capricorn. But that China was taking on more debt just to service existing debt is shown by transiting Jupiter 19* Aquarius squaring natal Venus 19* Scorpio in May 1997 (the chart ruler of the second house, which is Jupiter, and the natural ruler of the second, Venus are at odds). China’s foreign-held assets were in the form of property and were not easily liquidated. The Neptune-progressed Jupiter conjunction at 27*-29* Capricorn formed a T-square with the progressed Moon 29* Libra in the seventh house opposing natal Hades 28* Aries in November 1997, indicating that foreigners were willing to extend a (hidden) helping hand because they had so much at stake. It was not until 1998 that the Russian ruble, as well as Russian stocks and bonds, began to collapse. On August 17, 1998, Russia widened the trading band for the ruble against the dollar. On September 2, 1998, Russia abandoned the currency trading band against the dollar and allowed the ruble to float freely. On August 16, 1998, transiting Saturn went retrograde at 9* Taurus. In Russia’s chart, it formed a T-square to transiting Neptune 0* Aquarius conjunct progressed Saturn 5* Aquarius, opposing transiting Venus 3* Leo (Venus was again opposing the position of the February 1997 stellium). The progressed Moon and progressed Venus were both at 0* Sagittarius, ruled by Jupiter, and transiting Jupiter was in the eighth house. Note that Thailand and Russia had transiting Neptune conjunct progressed Saturn in their charts in 1997-1998 and their currencies and economies were severely affected. Indonesia was hurt as well; its chart had transiting Neptune in its eighth house, but transiting Saturn opposed its progressed Neptune. So in addition to a stellium and a total solar eclipse impacting a nation’s natal chart, an important third element is present during currency devaluations and serious levels of debt: transiting or progressed Neptune and Saturn in conjunction or opposition, and affecting the eighth house. Transiting Neptune was conjunct progressed Jupiter in China’s chart, sheltering China at that time. This was only an illusion, and a grave error (both effects of the twelfth house), as China was averting an immediate crisis by loading on more debt and not addressing structural problems in their economy. This is also the key to why Russia was not affected until 1998: it took another year for transiting Neptune to move into a close aspect to Russia’s progressed Saturn. March 9, 2016 was a total solar eclipse, just as in 1997, at 18*55’ Pisces. The progressed Moon of the eclipse chart is conjunct the progressed South Node 21* Pisces from May 7 to May 31. During this time period, these progressed points of the eclipse chart oppose China’s progressed Mars 21* Virgo. Transiting Saturn and Neptune are in square formation throughout 2016. On May 9, transiting Jupiter returns to direct motion at 13* Virgo, conjunct China’s natal Saturn, and opposing transiting Neptune 11* Pisces. This opposition forms a T-square with transiting Saturn 15* Sagittarius and China’s progressed Sun 14* Sagittarius. May 9, 2016 is an important day for China. It is the day of Mercury’s Transit across the Sun (Mercury passes directly in the front of the Sun, from the Earth’s perspective, similar to what the Moon does in a solar eclipse) at 19* Taurus, opposing China’s natal Venus 19* Scorpio, and forming a T-square with progressed Pluto 18* Leo. Although this formation highlights the seventh and tenth houses through other planetary correspondences, Venus and Pluto are natural rulers of the second and eighth houses of currency and finances. The Sun-Mercury conjunction in the third house indicates an official announcement. But with the transiting North Node 18* Virgo conjunct progressed Saturn on the cusp of the eighth house, this announcement concerns financial and/or currency issues. Agreements (seventh house) or manipulations that were hidden, but long supposed (assumed), will be revealed. The Sun-Mercury conjunction also forms a Grand Trine with progressed Saturn-transiting North Node 18* Virgo and transiting Pluto 17* Capricorn. The global glut of commodities is an issue, with outside pressure in the form of restrictions or tariffs being imposed. Conflicts within the Communist Party are also an issue, with Xi Jinping maneuvering to increase the Party’s (and his own) control on power. Planetary configurations that interact with the position of the March 9 solar eclipse indicate a period of apparent smooth sailing for the Chinese economy throughout the summer of 2016, but September 13, 2016 indicates a shift by investors to a more negative perspective on the country’s prospects. On December 7-10, 2016, transiting Saturn and the Sun 18* Sagittarius square progressed Saturn 18* Virgo, with transiting Mercury 6* Capricorn opposing the progressed Moon and transiting Hades 6* Cancer in the fifth house of the speculative markets. Power is firmly consolidated around Xi. He faces a continual challenge from powerful secretive opponents within the Party that is eroding his grip on power, but he pulls a surprise on them at this time. This time period leads into increased volatility in the Chinese and global stock markets, with a long-term high being likely. A very troubling sign of a massive buildup of debt is progressed Venus conjunct progressed Jupiter. This aspect has been within 3* of exactness since May 2012 (and, not surprisingly, has coincided with the slowdown in China’s economic growth). This configuration, being in the twelfth house of hidden issues, indicates that the amounts of debt in both the property market and the shadow banking system of China are far more than anyone suspects. But as these two progressed planets pass over the natal Ascendant 1* Aquarius and move into the daylight of the first house, the extent of the problem will be exposed. The world will begin to be aware of the extent of the problem during the Mars retrograde period of 2018, but even then, the problem is not addressed, probably due to the entrenched corruption surrounding state-owned enterprises – also ruled by Venus, Taurus and the second house. On September 17, 2015, progressed Venus entered Aquarius, now in the same sign as progressed Jupiter and the natal Ascendant at 1* Aquarius. This aspect remains in force for several more years, and transiting Uranus and Saturn form two critical configurations to it. Uranus will square these progressed planets and the natal Ascendant in 2018, and then Saturn will conjunct them in 2020. There are two areas of China’s national life that it affects: debt, property values, the financial system and economic conditions of the common people; and the Communist Party. On May 16, 2018, transiting Uranus enters Taurus. Uranus is in the fourth house by whole sign houses, a position that augurs difficult and persistent opposition to the ruling government – in this case, the Communist Party. But that it squares Venus, the ruler of Taurus, indicates a massive upset in property values. Progressed Jupiter in the mix exaggerates the losses. As transiting Uranus and Mercury are conjunct that same day (Mercury 4* Taurus) and Gemini-Mercury rules the fifth house of the stock market, a time period of extreme volatility in Chinese stocks is about to begin. On June 27, 2018, transiting Mars turns retrograde at 9* Aquarius, and appears to move backward through the early degrees of Aquarius and the last degrees of Capricorn, passing over China’s natal Ascendant, progressed Venus and progressed Jupiter in the process, while squaring transiting Uranus. In early to mid-August 2018, retrograde Mars moves back over China’s natal Ascendant, while Uranus goes retrograde at 2* Taurus. The heat is on. August 2018 will see fluctuations in the yuan. Transiting Neptune 15* Pisces opposes transiting Ceres 15* Virgo (and is moving into range of opposing progressed Saturn) in a T-square with progressed Sun 16* Sagittarius. The serious level of debt, the exposure of corruption, and an internal struggle within the Party puts pressure on China’s leadership, leading to serious missteps. Mars returns to direct motion on August 27 and proceeds to move back over China’s natal Ascendant, progressed Venus and progressed Jupiter once again. On September 20, 2018, transiting Mars and the Moon conjoin China’s progressed Venus 2°34' Aquarius, while the transiting South Node conjoins China’s natal Moon 3°03' Aquarius the same day. The Sun and Mercury 27° Virgo are conjunct the following day in China’s eighth house of foreign investment, foreign currencies, and taxes (and tariffs are taxes), and they square progressed Mercury 26°24' Sagittarius, which rules China’s eighth house. News about more tariffs affecting China could cause the yuan and China’s stock market to react dramatically. These tariffs are good reason for China to continue to rely on debt as stimulus to the economy. This could continue well into late 2019. In November 2019, transiting Jupiter conjuncts progressed Mercury, ruler of the eighth house of debt, while the progressed Sun has moved to 18* Sagittarius, squaring progressed Saturn 19* Virgo in the eighth house. In January 2020, a stellium forms in Capricorn, consisting of Jupiter, Mercury, Sun, Ceres, Pluto and the South Node. On January 10-11, 2020, the planets are in their tightest range: transiting Sun and Mercury 19* Capricorn, transiting Ceres 21* Capricorn, transiting Saturn and Pluto 22* Capricorn, transiting Venus 25* Capricorn, with transiting Jupiter outside this tight band, but still in the same sign at 8* Capricorn. Furthermore, January 11, 2020 is a lunar eclipse at 19* Cancer. This range of 19*-25* Capricorn puts these planets conjunct China’s natal Jupiter 22* Capricorn, in the twelfth house. This stellium indicates a major upheaval within the Communist Party in China. The struggle for control will be brutal, and there will probably be ruthless suppression of any uprisings or protests by the people. From March 2019 to March 2021, transiting Neptune 16*-20* Pisces opposes China’s progressed Saturn 19* Virgo. The Capricorn stellium occurs within this time band. This was the configuration in individual countries’ charts that triggered the breakdown in Asian markets in 1997-1998. Saturn is the heavyweight here. Saturn is reality, reality that cannot be avoided or denied. Saturn combined with Pluto, as it is in this case, is ruthless at pointing out reality until one acknowledges it. Sadly for the Chinese people, and probably the global financial system also, these multiple configurations coming together in such a tight time band indicate overwhelming pressure on the solvency of China’s financial system and on the yuan. Saturn, inspired as he is now by Neptune, is determined to prolong the agony: he continues to demand an accounting for every misdeed by passing over China’s natal Ascendant beginning in April 2020 and moving away from the Ascendant in late 2021. A hangover indeed. So in late 2019 through the first half of 2020, the same conditions apply to China as those that created the setup and the trigger for the Asian currency and debt crisis in 1997-1998: a stellium of outer planets aspected by inner planets, transiting Neptune aspecting (by conjunction or opposition) progressed Saturn, and an eclipse progressed Moon conjoining the eclipse Node.